YES! I'm a huge fan of raffles. And there are many, many reasons. And can be brilliantly profitable! 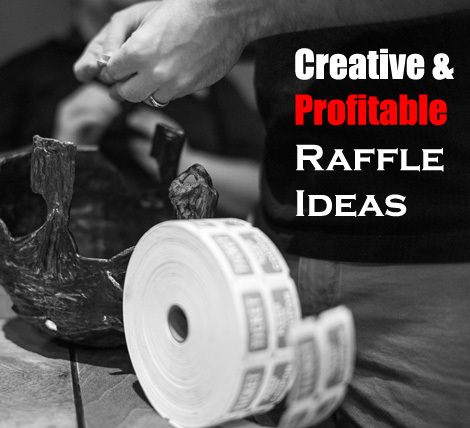 For advice and ideas on setting up a raffle effectively, take a read here. 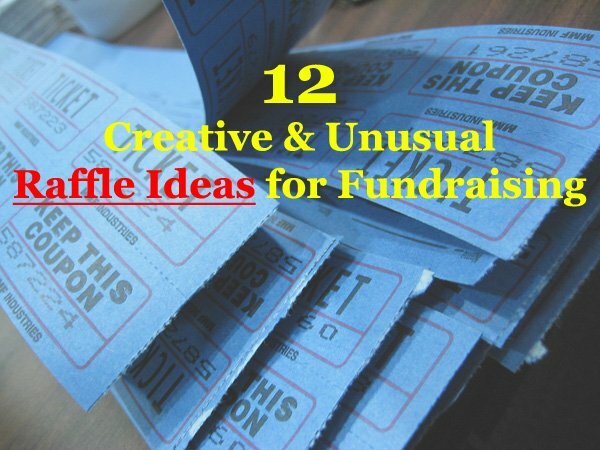 You might also want to look into Sherry Truhlar's Raffle and Auction game ideas to boost interest in your fundraisers, and increase funds raised! For Raffle Tickets - Look here. And remember that many of the below ideas can be mixed and used together! This is the basic raffle that everyone knows! For anyone wanting a fundraising idea that is free and easy to set up, this is your fundraiser! A 50/50 Raffle works very simply! Instead of finding prizes for the raffle, the winner will receive 50% of the funds raised as the prize. It's that simple!!! It's also a fast and profitable fundraiser that anyone or any cause can use. Read here for great ways of making a 50/50 raffle fundraiser super successful. And get your 50/50 Raffle Tickets here. This is a fantastic high end 50/50 raffle idea that my local primary School ran in 2013 with great success. Just like the above, the prize will be 50% of the funds raised, but the tickets will be sold at a high price, with only 100 tickets available. By doing this it creates a limited availability of tickets, increasing someone's chances of winning, and increasing the perceived value of buying a ticket! You should also create more excitement with it by doing the drawing as a reverse raffle (see below). A reverse raffle adds a fun twist to your raffle and can create an enjoyable bit of entertainment at any event. It is generally more suitable to limited raffles, like the above hundred club. How it works, is as tickets are drawn they are eliminated from the raffle instead of the 1st ticket drawn being the winner. The last ticket standing will then be the prize winner. You can also allow people to buy their way back into the draw (for say twice the ticket price) at certain stages of the raffle to increase earnings! There are many ways of doing this raffle idea, and you can get really creative with it. For example fill a car with balloons, and let people guess how many balloons are inside for a fee. The person/s who guesses or has the closest guess wins/shares the prize. Or you could have a penny drive, full an empty 5l bottle of water with coins through the drive, and then have people guess how many coins are in the bottle for a fee, and to win a prize of some sort! Get creative with this one and you can have some real fun. Have a map of your local town/province/state etc., that has a hidden imaginary treasure (the prize). Participants then buy numbered pins and place them on the map where they think the treasure is hidden. Closest to the treasure wins! Have a large field that is divided into blocks. People then purchase block/s for a fee in an attempt to guess where the helicopter will drop the prize bundle. Encourage your helicopter pilot to circle and swoop over the field quite a bit to provide some intense anticipation before he drops the parcel. And maybe have the parcel drop set for a certain time so to make the drop more random as he flies over the field. This Heli Drop can also be incorporated into the Golf Ball Drop down below. Obviously you'll also need to hire or find a willing Helicopter owner to help you out with this one. Read more about this unique raffle fundraiser here. Almost exactly the same as the above idea, but instead of having a helicopter drop a parcel; you employ the services of a cow and its poop! The block that the cow drops its patty in wins! Both the above two ideas are perfect for fairs, carnivals, and other similar events! It's the perfect addition to many fundraising events, and there are a few different and creative Wine Pull Raffle Ideas that you can use. Participants will purchase a "wine pull" that gives them the opportunity to pull a bottle of wine from a selection of expensive, cheap, and medium range wine. Meaning they will always walk away with something, but have the possibility of pulling a really awesome bottle of wine!!! Read more about this great fundraiser here. A high end raffle idea that can be exceptionally profitable. You'll need to acquire an awesome car for the raffle. Setup a deal with a local dealership, where you'll pay for the car once the raffle is over. That way you won't need to put up any upfront capitol. And then you'll need to market, promote and sell tickets to a large number of people to make it successful. Read more on the Car Raffle Fundraiser here. A Chinese Auction is pretty much a silent auction and a raffle, mixed into one. And it's a pretty cool and effective idea! Participants purchase numbered bid tickets for a specific price. They then use those tickets to bid on the items that they want, by placing the bid tickets in a bowl or box, next to the item. At the end of the auction a ticket is drawn from each item's "bid tickets", and the owner of that ticket wins the bid and the auction item. Another creative and cool raffle idea, right?! The last of these Raffle Ideas is another really cool idea. The Golf Ball Drop works by people purchasing numbered golf balls. The golf balls are then dropped by any number of means onto a Green, for example from a Helicopter or from a tipping bucket on a tractor. The ball that then goes in the hole, or is nearest to the pin, is the winner! 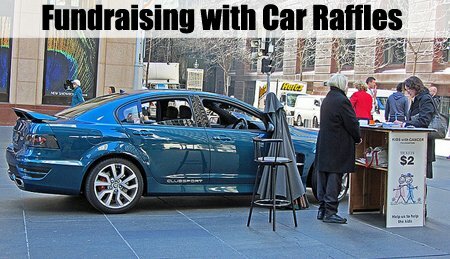 A very simple, but very effective fundraising idea! Sherry Truhlar's Raffle and Auction game ideas is a fantastic resource for getting your creative juices flowing and making your events more fun and successful! And you can get your tickets here.